Looking for any ideas, help, lessons learned, etc. as I start to build this setup in the garage. Current space is about 10’ wide of clear space, 18’ from the garage door to screen location. 13’ ceiling height. My current plan is to have a shag rug that is 8’ x10’ and have that down just in front of the screen, then have the hitting mat just at the end of it 10’ from the screen. Then get a short throw projector to sit on the floor about 5’-6’ from the screen with a small protector box. Screen will be 10’ high and currently between a couple of widths. My first plan is to get a 13’ wide screen, and mount HD aluminum curtain track to the ceiling so I can let it drape and slide out of the way if needed. I was going to get 13’ somI could do a 90* curve and have 3’ of screen come around for shank/toe miss possibly. Or could just do 10’ width and let it drape flat. Anyone done anything like,this, or have any other ideas? I have looked at building a frame out of pvc, conduit,,and wood, but really liking the drape and track idea best. Thanks for any help, and we are planning on giving the Rmotion a try. Current space is about 10' wide of clear space, 18' from the garage door to screen location. 13' ceiling height. My current plan is to have a shag rug that is 8' x10' and have that down just in front of the screen, then have the hitting mat just at the end of it 10' from the screen. Then get a short throw projector to sit on the floor about 5'-6' from the screen with a small protector box. Screen will be 10' high and currently between a couple of widths. My first plan is to get a 13' wide screen, and mount HD aluminum curtain track to the ceiling so I can let it drape and slide out of the way if needed. I was going to get 13' somI could do a 90* curve and have 3' of screen come around for shank/toe miss possibly. Or could just do 10' width and let it drape flat. There are others here if you search, most notably dornstar's thread on skytrak ($2600 build). My suggestion would be to avoid skimping on the launch monitor and the mat. Everything else, go as budget friendly as you can. Skytrak is the cheapest LM that actually works well, and you can DIY a good mat for $50-100. I would strongly suggest looking into building your own divot action or truestrike mat, as many of the others are well known for causing injuries over time. As for your screen, if you're building a frame, EMT conduit is your best bet, but a retractable ceiling track would be cool. Just be sure it has proper tension on the sides as well. I'd recommend either Carl's Premium screen or the PR-20 from West Coast Netting. Happy to answer any questions you might have! So I have been able to prep the garage and move my hitting mat and Skilz 8’ net in to get a feel for the space and how I want things positioned before ordering. Decided to go with a 13’x10’ Carl’s screen on a curtain track. The ceiling where it mounts is 13’ and figured it was just easier to go floor to ceiling. The mat I have cost about $110, but can’t remember what brand. It’s a thick rubber mat with turf. I doubt I will get out there and just pound iron shots. It’s more for,just staying loose, having some fun and letting my kid practice. If I plan to hit more than say 50 full iron shots in a day I will probably just go to the range. I decided to go with an Optoma GT1080Darbee projector, but now seeing it on Amazon that it has jumped up $45 since yesterday. So might just get the BenQ equivalent. Got the Rmotion in the mail today. $247 on sale on Amazon. Quickly registered it and installed on the laptop for a test run and was very impressed. No misreads, no lag, good read on different strikes. Thin, smooth, hard, and fades. Really looking forward to seeing it on a 120” screen. Good luck. Rmotion seems good, wont be long till you "need" to trade up to a skytrak. Trust me! I know. 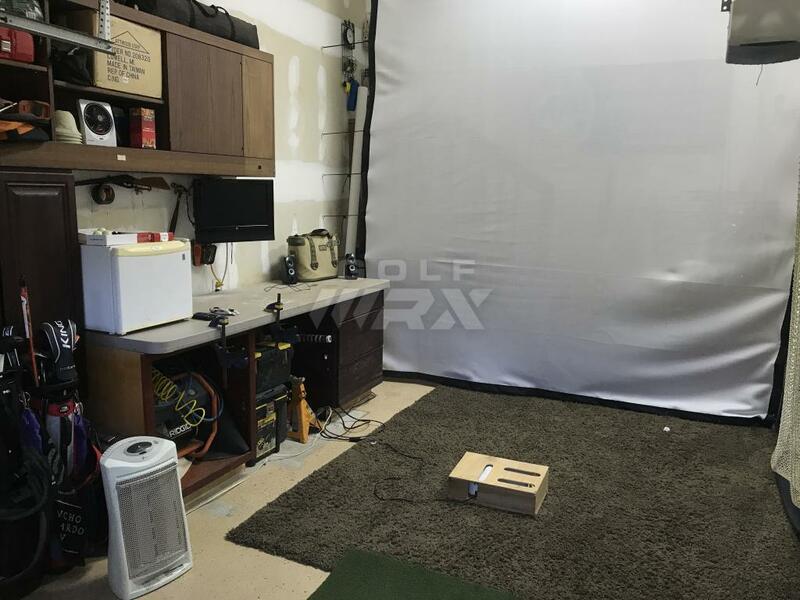 My expectations of this was to have a golf video game that I hit my own clubs and ball just like I do in the net in the backyard, but give me the comfort of the garage with the fun factor of the "game". I know it gives me nothing to understand my swing or true ball flight data, but if it gives the family something to play together and gets my son to hit balls, then it's worth it. That's why I wanted to spend my money on the entertainment part first, proper setup, screen, projector, etc. instead of just buying a Skytrak and hitting into a net. The hard part will be done, and we can enjoy football in January with the screen, and can always add the Skytrak or completely switch to a Flight scope next year. Once my son really wants to start honing in his swing, I will invest in that and probably set him up some mirrors and cameras their also. This is what I have so far and it will double as a good man cave game/football screen. 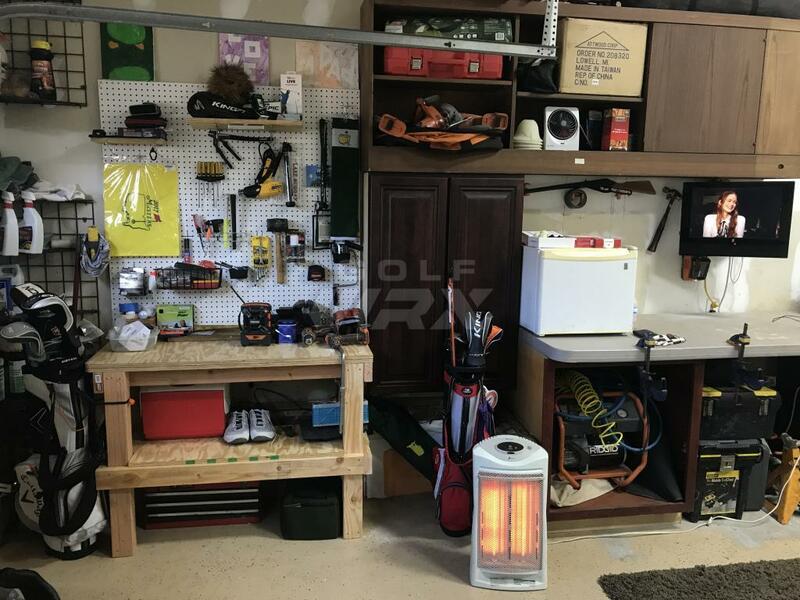 The workbench was already setup and I will now have plenty of room in the garage and the wife can have the bonus room back. 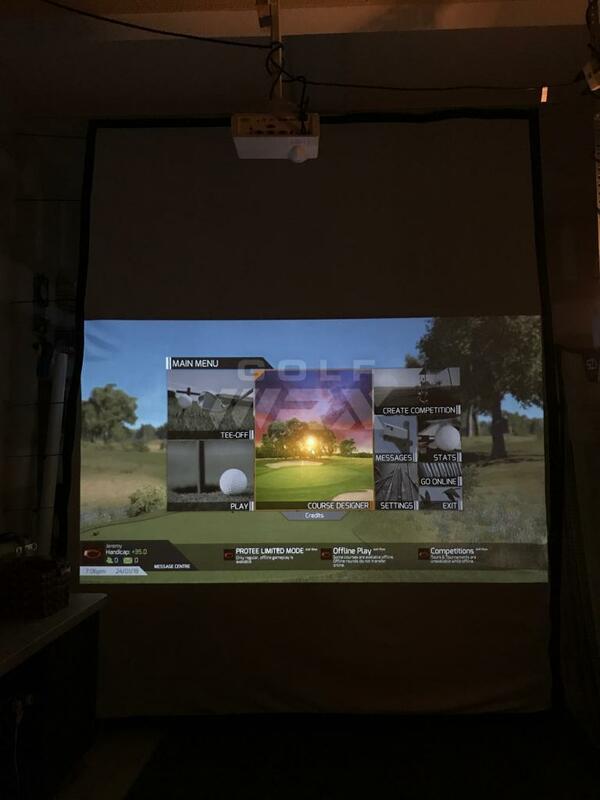 Gotta love a wife who makes the suggestion to put in a projector screen golf simulator. The screen and projector should be here next week. So hopefully by next weekend all will be hung and pictures and screen shots can be posted. I will still need to get the xtra clips from RMotion, but this should round everything out for Christmas. Anyone know where or what to get for tees in the mat? I see on the GC they have these little tripod looking ones but can't find them. I don't think my may will take regular tees like Shiels and others do on youtube. Any updates on the r-motion? I’d like something that can show club path and rough basic numbers and it’s hard to find reviews. 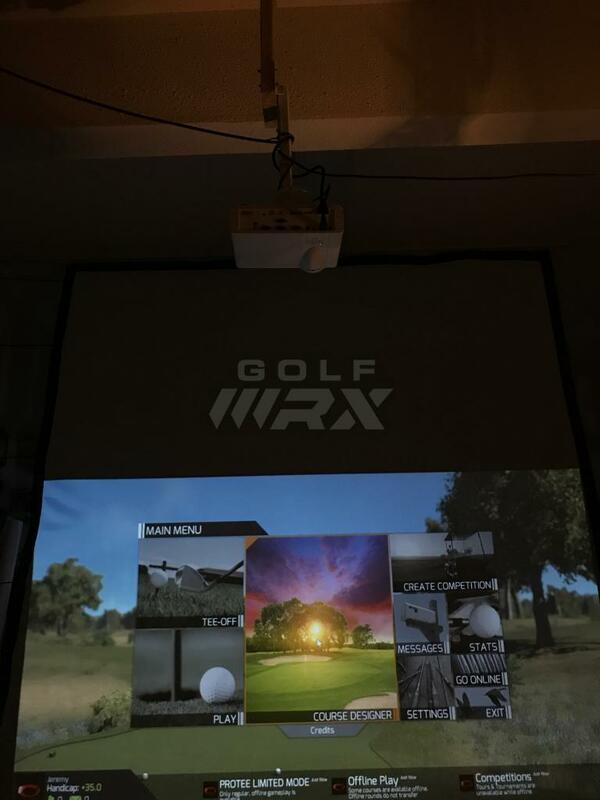 The beauty of the r motion is that eventually when You do decide to upgrade to a skytrak, the software works together so you get the skytrak and clubface data which is nice. I saw par2pro on YouTube did a video on how it works. It's great. The graphics are phenomenal and you don't have misreads. Putting is horrible, but I knew that going in. Pitching and chipping gives low spin but you can still play a round once you get used to the roll out. Distance were close to my actuals. Club head speed is great. It reads path and gives proper ball flight. No ball data so toe hits and thin hits still read a full straight shot. I use it to groove ball striking and work on fades/drawers. And use it for speed training with my driver. The best part is my setup in the garage. Everyday I go out and hit a few balls even if I don't fire up the software. It's nice to have a golf hangout now with my workbench and a tv all in one spot. Nice job! Do wedge shots hit the ceiling before the hit the screen? No. Ceiling is 13'. I get a little closer about 8' away for full 64 and 58 shots. They hit the screen and spin up to the ceiling sometimes. Holy ****! I want! I need! I want and need! 1300 for a full sim? Does it capture pretty accurate? Nice job and this is where I'm going with my half of the garage. I need to just do it. I currently have a crappy iPhone looking thing that I set up beside the ball that I hit into a net from a hitting mat. It gives the basics as far as SS, distance, ball speed, etc. That depends on it even picking it up which is about 40/60. It giving accurate results based on what I think the shot felt like is about 10%. A full sim in my garage will flat out make me die a happy man. I have to do something like this soon. Keep in mind you'll need a gaming PC and the actual SIM software to complete the package, so $1300 total is not realistic. Also, I don't mean to rain on OP's parade, but RMotion is not accurate for club data. It'll be generally ballpark, yes, but you get what you pay for and there is a reason that club data with the leading names is an extra several thousand dollars at a minimum. I'm pretty sure I stated that this was setup as a game and a spot to just practice. Not club data. But apologize if I didn't. The software was included in the budget. The computer was an old laptop left over from work. So your mileage may vary. 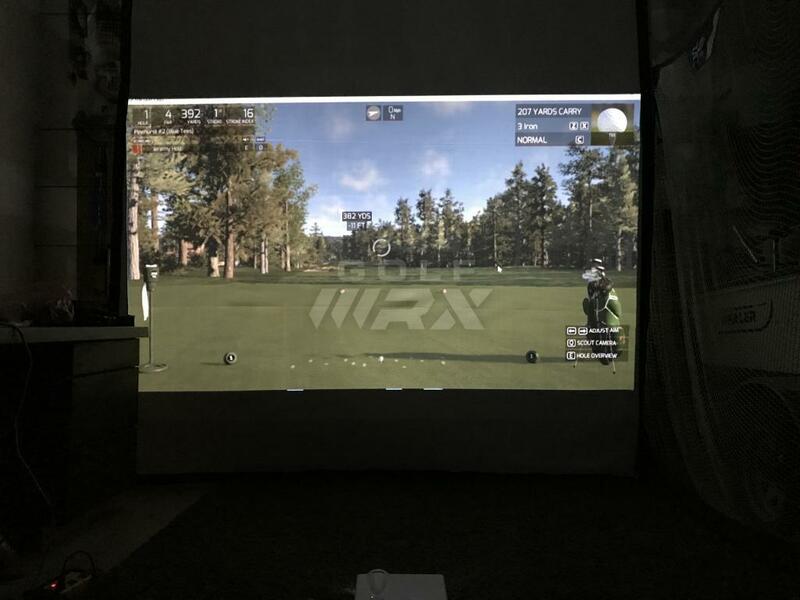 My expectations of this was to have a golf video game that I hit my own clubs and ball just like I do in the net in the backyard, but give me the comfort of the garage with the fun factor of the "game". I know it gives me nothing to understand my swing or true ball flight data, but if it gives the family something to play together and gets my son to hit balls, then it's worth it. That's why I wanted to spend my money on the entertainment part first, proper setup, screen, projector, etc. instead of just buying a Skytrak and hitting into a net. The hard part will be done, and we can enjoy football in January with the screen, and can always add the Skytrak or completely switch to a Flight scope next year. Once my son really wants to start honing in his swing, I will invest in that and probably set him up some mirrors and cameras their also. In case you missed this part. Absolutely, and I think it's great that you and your son are enjoying it! I was trying to clarify some info above for Dale, as it was clear his expectations for a full sim experience are not in line with what you are doing. I stand corrected about the software, I knew the full TGC software wasn't included, but you do get a 15-course limited license, which is great. I hope you continue to enjoy it, it's no doubt miles better than just hitting into a net with no feedback at all. I got you. Yeah, no one should look at this and think they are going to evaluate your game any better than hitting into a net. At best it will help with swing speed, but what good does that really do with training. This is just the first step. I'm hoping something accurate and sub $1000 will be out by the time this wears off. Thanks! Snuck away last night from the family for an hour. Regripped 4 Clubs, played some music and chipped a little bit. Man I love this setup. I have the RMotion also and really like it. I still only have the 4 clips as I have still being playing real life golf. My setup is far less superior than yours but it is all I have to work with. It is in my bonus room over the garage and has a sloped roof. Since I am right handed I set the area up on the right and hit into a make shift net and display the image on my 40 inch flat screen. I am not concerned with ball data at all. Not sure why so many people are but that is on them. 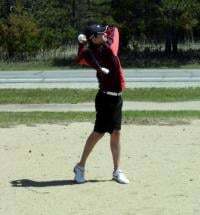 My main goal is to have a club in my hand and able to make full swings. I used almost golf balls type of balls and played outside yesterday and could see my indoor sessions are working. Which was cool. I see in your picture you were playing Pinehurst #2. That course is a beast on RMotion. LOL. Keep doing you and have fun with the setup!!! Have you figured out anyway to play from shorter tees? Makes it a challenge when my son plays hitting 565 yd par 5s. I think most of the options like shorter tees and saving players data is reserved for the membership full account. Unfortunately I don't think you have a tee option. TGC doesn't have that ability. 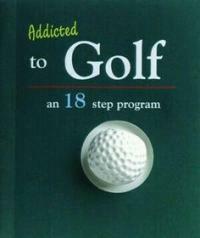 I think Jack Nicklaus Perfect Golf does. I wouldn't be too concerned about par when playing a course like that though. 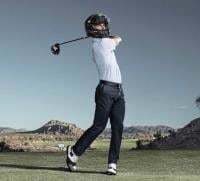 Just tee it up and make good swings. Maybe Rapsodo will give us more courses and options in the future. Upgraded the setup a bit tonight. Hated the projector on the floor. Much much much better now.